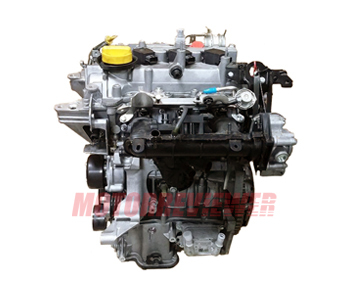 The small 0.9-liter turbocharged three-cylinder engine H4Bt was developed jointly with Nissan Company (Renault named all these engines as H series and Nissan - HR series). The engine combined all modern technology for today available in the low-cost market segment. Renault pursued the strategy of downsizing in the engine development and the using of turbocharging for increasing engine efficiency. The cylinder block made from light aluminum alloy for reducing the weight. The cylinder head is also aluminum. It has two overhead camshafts and four valves per cylinder (12 valves total). The intake camshaft equipped with variable valve timing system VVT. The fixed geometry turbocharger is integrated into the exhaust manifold and combined with VVT system ensures that maximum torque is available at low engine speeds and across a broad rev-band (boost pressure 2.05bar). 0.9l TCE engine has lifetime timing chain, variable displacement oil pump, spark plugs with individual coils. The electronic multipoint injection system (indirect injection) delivers fuel into cylinders. The engine is quite torquey and powerful for small A and B class cars. The new decisions in design allowed reducing fuel consumption by 25, and at the same time, the engine meets Euro5 and Euro6 European emission standards (environment-friendly motor). The engine service intervals were reduced which also reducing the cost of maintenance. The accessories belt and the tensioning roller must always be replaced once removed. Do not run the engine without an accessories belt as this will destroy the crankshaft accessories pulley.